When Bruce Springsteen announced an album of covers and reworkings of his own material, my initial reaction was tepid, and I imagine a lot of people reacted similarly. After the more introvert Wrecking Ball (2012), an album with new material and the E Street Band in full gear would have sounded like a much better idea, after all. Imagine the surprise then, that High Hopes turns out to be The Boss’ most spontaneous sounding and solid rocking album in ages. The album kicks off with the title track, a Tim Scott McConnell song that Springsteen had already recorded somewhere back in 1996 for his Blood Brothers EP, and it’s a fitting opener for the record. It’s a stomping rocker that sets the tone brilliantly. It is also the first showcase for the very funky guitar antics of Tom Morello (of Rage Against the Machine fame), who has filled in for Little Steven on a couple of dates when he was forced to drop out because of scheduling conflicts (Van Zandt has his own comedy/drama show Lilyhammer these days which he produces and stars in). Springsteen then delves into his own back catalogue of outtakes with Harry’s Place, a leftover, introvert rocker from the The Rising sessions, before we arrive at High Hopes’ first real highlight: American Skin (41 Shots). The song, written back in 2000 as a response to the shooting of Amadou Diallo in New York City (and more recently dedicated to Trayvon Martin), receives its first proper studio release (not counting the 2001 promo version) here, and whilst nothing can top the live version of the song, both on stage as well as the one found on 2001’s Live in New York City, this is the next best thing. Especially in the second half of the song, it explodes into a blistering rocker full of thunderous guitar work, and proves again to be one of Bruce’s best songs of the last two decades. After the uncommonly jolly Just Like Fire Would, complete with some very Sgt. Pepper-y brass-work, another The Rising outtake follows with the haunting Down in the Hole, a melancholic ballad. What makes the track so much more melancholy and haunting than it already is, is the contributions of the late E Street Members Clarence Clemons and Danny Federici. With Heaven’s Wall Springsteen injects some rocking gospel into the album, whilst Frankie Fell in Love deals out some country vibes. On This Is Your Sword we find The Boss once again flirting with Irish instrumentation. The depressingly mellow Hunter of Invisible Game is the first dud on High Hopes, sounding like an outtake from the Working on a Miracle sessions. It’s not a bad song, but it relies too much on gentle strings and sounds a bit off between the more upbeat songs before it and the reimagining of The Ghost of Tom Joad after it. And there it is, the cat out of the proverbial bag: The Ghost of Tom Joad. Lifted from Springsteen’s 1995 acoustic solo album of the same name, the song has basically become a Springsteen/Morello showcase here. The acoustic skin shed, Tom Joad becomes a raging rock song with screaming guitars, Morello’s modulations and a dynamic between the more mellow verses, the fiercely rocking refrain and the two longer instrumental parts that makes it into the highlight of High Hopes. It’s a song so powerful and raw, and executed so incredibly well, it deserves to be played over and over at the highest possible volume. Goosebumps guaranteed. Let it be no surprise then, that High Hopes dies out like a candle on the ballad The Wall and the Suicide cover Dream Baby Dream, which has somehow morphed into something between a country ditty and an electronic track. So, to be completely honest, High Hopes fares a whole lot better than expected. After the very over-produced and polished sounding Magic and Working on a Dream and the darker, more-or-less solo effort Wrecking Ball, Springsteen surprises friend and foe with a solid hard rock album that sounds more raw and live than those last few records did. 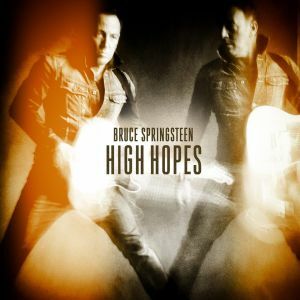 With a few nice surprises on it and two absolute highlights in the form of American Skin (41 Shots) and The Ghost of Tom Joad, High Hopes is an album sure to please any fan of The Boss. This entry was posted in RP and tagged 2014, Bruce Springsteen, E Street Band, High Hopes, review, Sony Music, The Ghost of Tom Joad, Tom Morello. Bookmark the permalink.